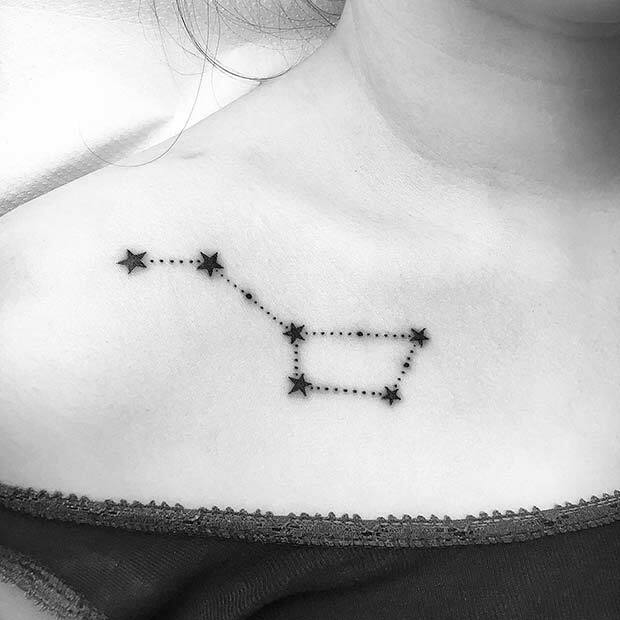 Stars are one of the most popular tattoo designs. There are so many styles and meanings so every tattoo is unique. 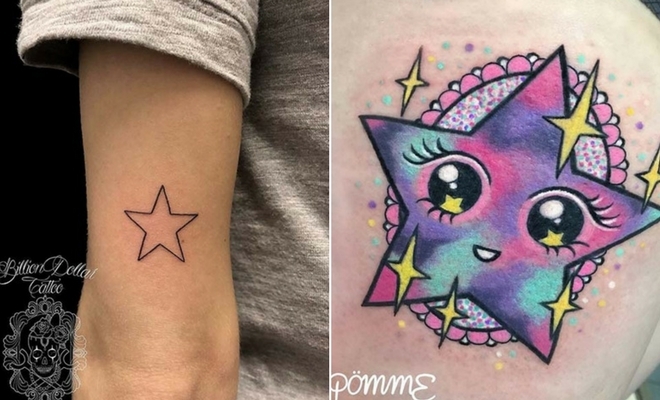 We love star tattoos and think you will too, so we have found 21 of the best star tattoo designs. From simple outlines to vibrant pieces of art, we have something for everyone. Our first tattoo features three stars. While the tattoo will have different meanings to each person it is said that three stars symbolize the journey we take. It can be about the road we have traveled, or it can be about growing up. No matter what the meaning is, it is an awesome tattoo. 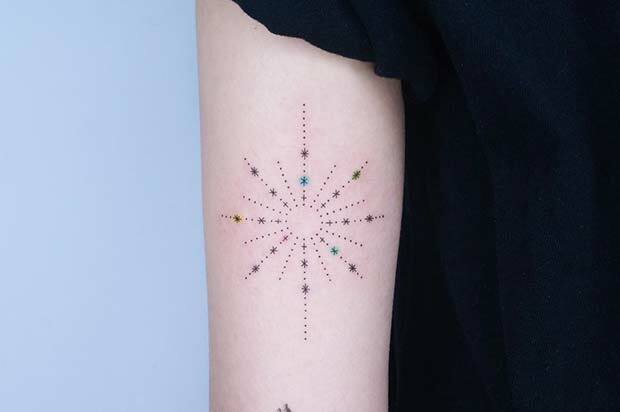 Star constellations have become super stylish tattoo designs. This constellation art features small stars and dots. You can recreate your own design with a constellation of your choice. There are also lots of different styles you can choose from. We like this one because of the unique design and the story it can have behind it. Next, we have a tattoo idea that was inspired by the Japanese style kawaii. Kawaii style is all about being cute and colorful. 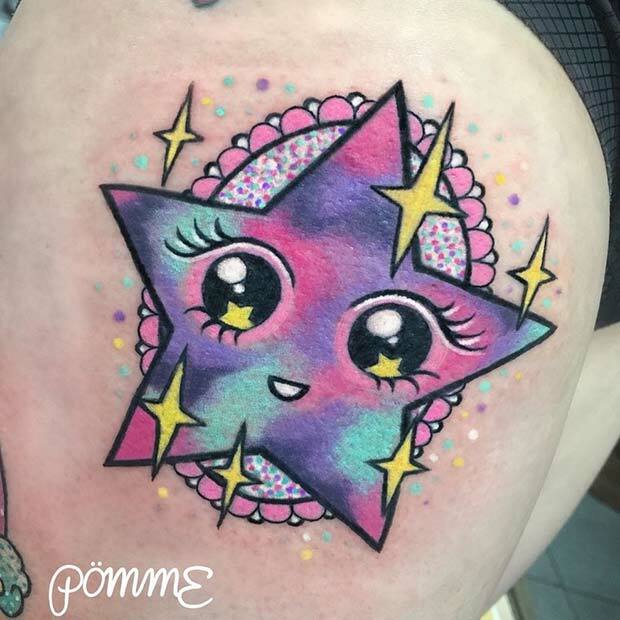 The featured tattoo uses bold pink, blue and purple colors and the star is super cute looking! A tattoo like this is perfect for someone who wants a fun and vibrant design. Armband tattoos look cool and stylish. 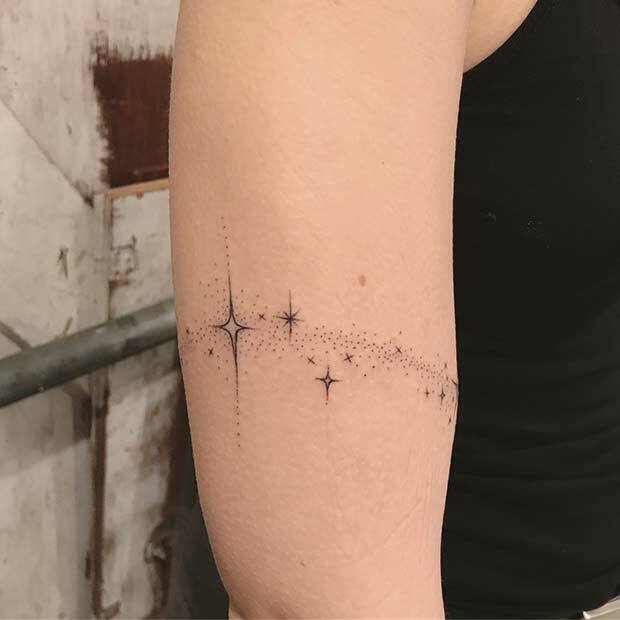 This armband tattoo features stars and sparkles. We love the sparkly stars because they make the tattoo look magical. You could have a similar design created as small tattoo rather than an armband. It is a pretty idea that would suit everyone. 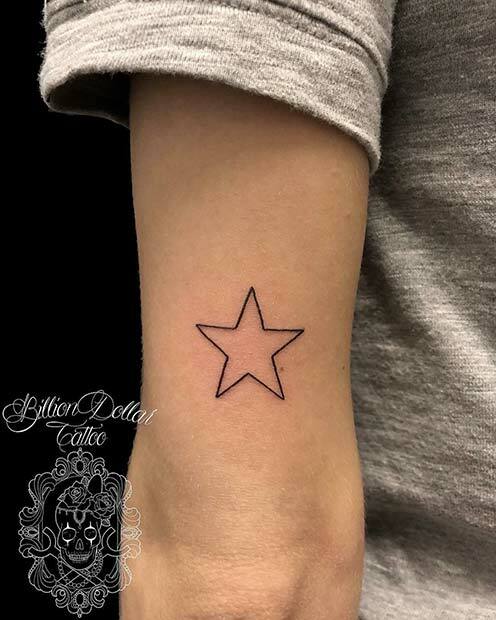 One of the most popular star tattoos is a simple outline like this one. We can see why many love the design because it is stylish, subtle and will suit anyone. Not only that but because of the simplicity, the actual tattoo doesn’t take too long to create, which makes it great for a first tattoo. You don’t have to choose just one star. Why not have multiple stars designed like our next tattoo? This back tattoo has been created with stars in different sizes and some colored in. It is such a pretty design. You can recreate this idea with more or less stars and you could even add some different colors. Rihanna has a similar tattoo design on her back. If you are looking for a cute tattoo, then this next idea could be for you. 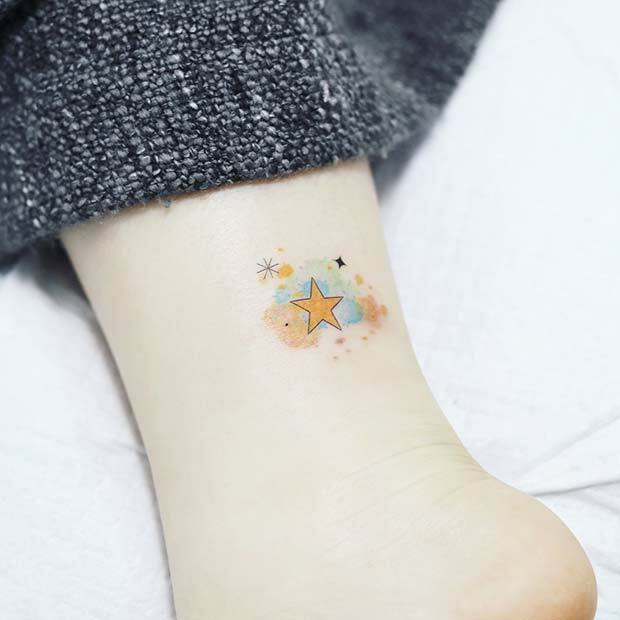 Here we have a small yellow star that has been inked onto the ankle. It also has some background color and other star shapes surrounding it. You can have a similar tattoo created but you could try choosing a different color for the star or maybe try no background. We love this next tattoo idea! 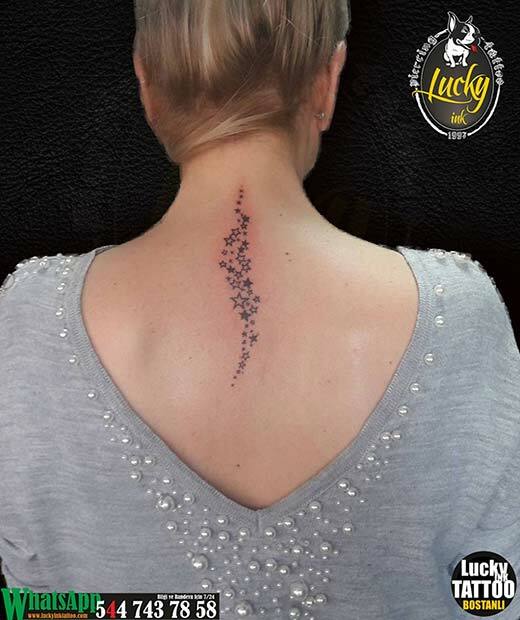 The tattoo is made up of small stars and dots to create a large star shape. Some of the stars have also been colored in vibrant ink. It is a very pretty and feminine tattoo that would look beautiful on anyone. You could have a smaller design created and have it placed elsewhere on the body. 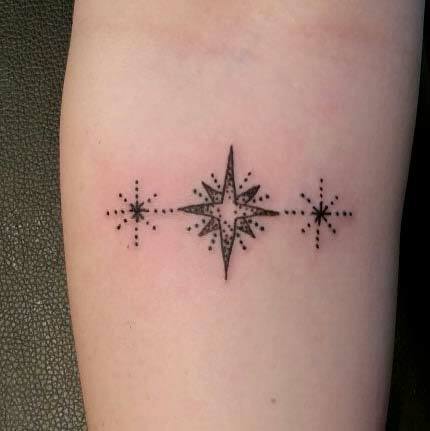 Looking for a more detailed star tattoo? Then you need to check out this idea. 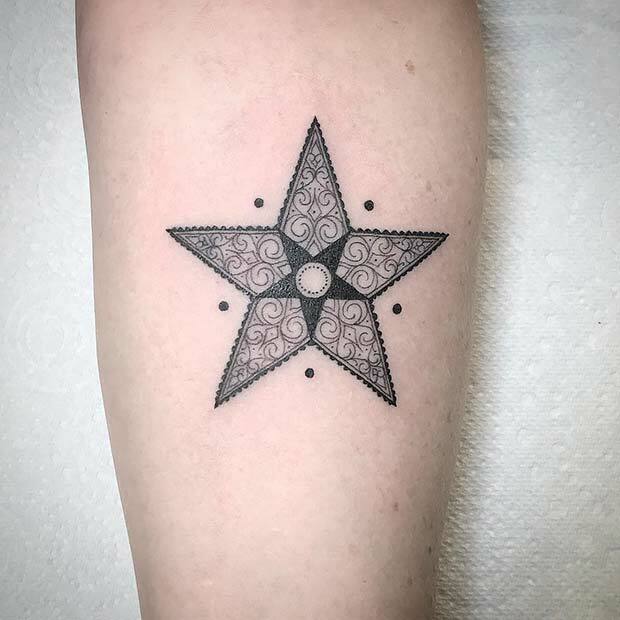 This ornamental star has been decorated with an intricate pattern, dots, shading, coloring and more. It is an amazing work of art. You could take inspiration from this design and create your own star with your own patterns and colors. Got someone special in your life? Maybe a family member, friend or partner? 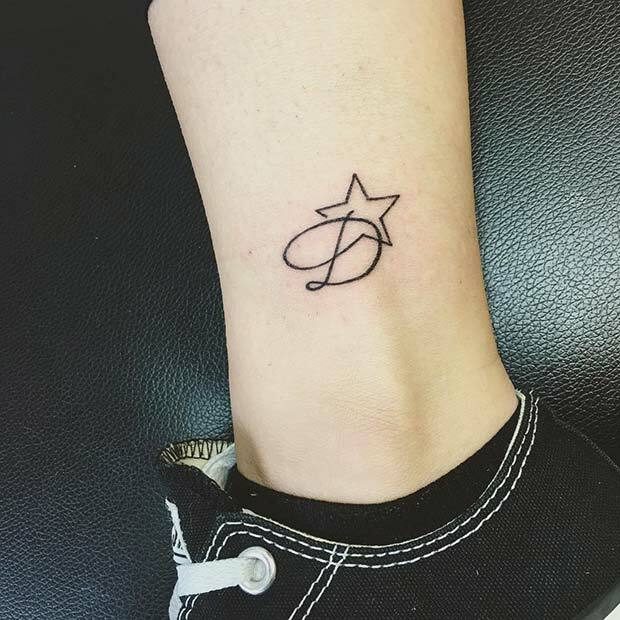 Then consider a star tattoo with their initial. Initial tattoos are a way to show someone how much you care. This tattoo idea could show them that they are a ‘star’ in your eyes and have a special place in your heart (and on your body also). beautiful tattoos! i am a star symbol person!! !